Gorilla Media are often employed to deliver a political message and for lobbying purposes. Press photo editors and TV news producers like the AdVan which acts as a message backdrop while the interviewee gather in front. 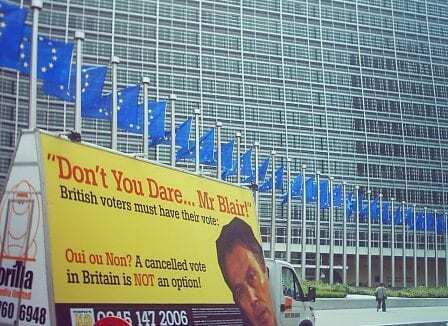 Non so much as The Freedom Association who were demanding a referendum and had us mirror the then Prime Ministers movement including the Labour Party Conference in Brighton, Prime Ministers Questions at Westminster and even The European Parliament in Brussels.